This 63-year-old woman moved to St. Louis from Florida. She was planning to get remarried in two months and was looking into how a St. Louis cosmetic surgery procedure could help her achieve a refreshed appearance. She worked in sales and was also seeking to look more presentable. Living in Florida, she had a lot of sun exposure. In addition, she had quit smoking cigarettes four months prior. She had used Retin-A cream for the past few years. She was bothered by acne scars. She wanted to improve the appearance of the jowl area. In addition, she was bothered by the excessive skin on the upper eyelids and the prominent wrinkles on the upper lip. 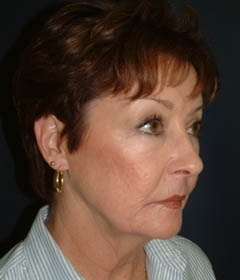 She underwent an upper eyelid lift, along with tightening of the neck area and a face lift in St. Louis. Dermabrasion was performed around the mouth. 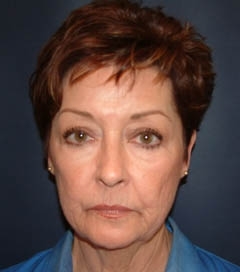 Fat taken from her stomach was injected to fill out the wrinkles in the upper lip, the cheek folds, and the other wrinkles around the mouth and eyes. Ten days after the procedure, the area around the mouth had completely healed. Five weeks after the procedure, the incisions are noted to be healing well. She was started on Obagi Skin Care Program. Her photographs are shown six months after her procedure. Photographs from her wedding show the outstanding results.